Rep. Elijah Cummings (D., Md.) said on Monday he would support House Minority Leader Nancy Pelosi (D., Calif.) to be speaker of the House if Democrats regain the majority, and she would stay in that position "until she decides to leave." His comments on The Hill TV come after speculation that younger and more left-leaning Democrats coming into office might push Pelosi out in favor of a new face. "I expect Nancy Pelosi will be speaker, and I believe that she will be speaker until she decides to leave," Cummings said. Several Democratic candidates ran a primary campaign promising to vote against Pelosi as speaker if they win election as a part of a Democratic majority. "I think that she is a phenomenal speaker," Cummings said. "She knows the members. I can't think of anybody in the House that could have seen through the passage of something like the Affordable Care Act." Some of those members that Cummings claims Pelosi "knows" have spoken out against her as well, such as Rep. Kathleen Rice (D., N.Y.), who called for Pelosi to be ousted over a year ago. "We need leadership change," she said. "It's time for Nancy Pelosi to go, and the entire leadership team." Rep. Seth Moulton (D., Mass.) has made similar arguments, saying, "It's clear that, I think, across the board in the Democratic Party we need new leadership. It's time for a new generation of leadership in the party." Cummings said Monday critics of Pelosi have made her a "boogie woman" when in reality she is an "effective" leader. "Nancy has worked hard," he said, "and they tried to make her the boogie woman. The reason why they tried to do that is because she is effective. Even under the circumstances that we're in now, when I look at the budget that we passed, I mean the appropriations that we're doing, clearly her leadership shines through." 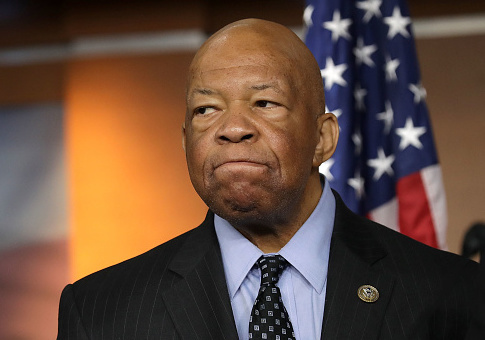 If Democrats take back the House of Representatives after the November midterm elections, Cummings is expected to become the chairman of the House Oversight Committee. Pelosi, who was first elected to Congress in 1987, faces Republican challenger Lisa Remmer in November. This entry was posted in Politics and tagged Elijah Cummings, Nancy Pelosi. Bookmark the permalink.